The White House’s situation room may be the most well-known SCIF but there are others as well. SCIF stands for Sensitive Compartmented Information Facility, which is a secure place in which sensitive information is able to be viewed, discussed, and kept safe from outside surveillance. If you’re thinking the White House’s situation room, you’re on the right track: it’s likely the most famous SCIF, where classified military and foreign policy decisions have long been made. 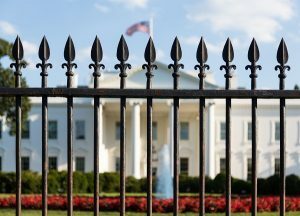 These areas are intended to only allow access to individuals with the appropriate security clearances so it’s critical that they invest in top-notch security measures. There are a few strict guidelines laid out by The Office of the Director of National Intelligence as to what goes into a SCIF. Essentially, designs are engineered so that any electro-magnetic signals (the kinds emitted by phone systems, cellular, even computers) are shielded in a sophisticated way so that there is no eavesdropping possible. This includes an effort to minimize, or even eliminate, windows in the SCIF. It also places an emphasis on acoustic protection, including soundproofing or, if unavailable, speakers can be used to funnel in noise (noise masking) that masks the conversations within the SCIF. Some SCIFs, like the situation room, are permanent, while others are temporary and even mobile. Sometimes, presidential hotel rooms or immediate surroundings become SCIFs while government officials travel. SCIFs are used for establishing a secure space to discuss sensitive information. Historically, there has been one in the White House, but they’ve also been utilized elsewhere. For example, NBC reports that President George W. Bush’s ranch in Crawford, Texas, contained a trailer that was converted into a SCIF. Similarly, Hillary Clinton reportedly told Congress that during the Benghazi investigation, her home in D.C. had a SCIF. These are essential spaces for national security and protecting our nation from potential surveillance efforts. Non-cleared personnel who enter an SCIF are under constant oversight of security forces. All classified information and material must be removed from their view in an attempt to prevent unauthorized and undesired access. These non-cleared personnel are also usually required to surrender any recording, photographic, or other electronic devices. Some SCIFs may also utilize audio and visual systems to monitor the security of the space. This entry was posted on Tuesday, October 3rd, 2017	at 9:36 am	. You can follow any responses to this entry through the RSS 2.0 feed. Both comments and pings are currently closed.